The form of a chirograph, which set out the terms of a contract, came from the need to make an authentic copy of the contract available to all parties, specially when the contract involved real property or the use of land to secure a loan. 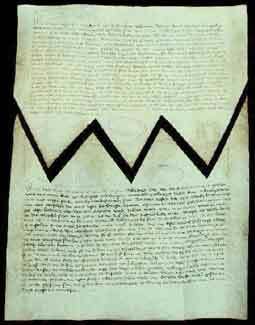 The contract was written out twice or three times on a single parchment which then had through it the Latin word chirographum written between the copies. The document was then cut irregularly, often in simple zig-zag, through the word and each party given a piece of the original. By later aligning the pieces like a simple jigsaw puzzle, a subsequent observor, such as a Court of law, could ascertain the authenticity of the whole. The process also made forgery and counterfeiting difficult. Lincoln, F. Ashe, The Starra: Their Effect on Early English Law and Administration (London: Oxford University Press, 1939).